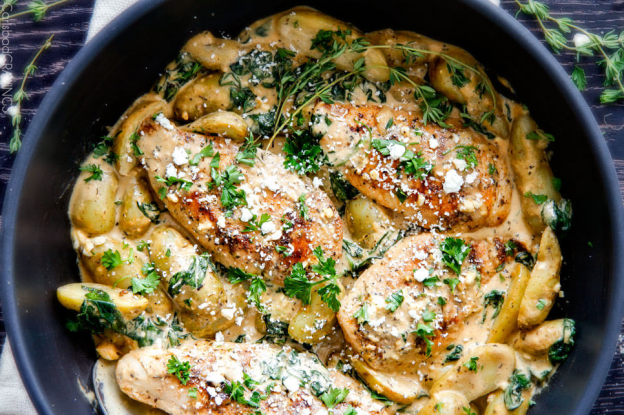 One-pot meals like this maple dijon chicken skillet are the easiest way to feed hungry mouths without much effort. With such a tasty fusion of flavors and fewer dishes to wash up, you'll definitely want to make this a go-to option. These Spanish empanadas are little hot pockets of delicious! In a bowl, combine the flour, beaten egg, lard, warm water, and olive oil, and mix thoroughly. In a hot pan, pour a little olive oil and sautée the onions, until tender. Add the ground beef, salt, pepper, chili powder, cumin, garlic and diced tomatoes. Cook until beef is no longer pink, and the flavors have incorporated well. Roll out the empanada dough, and cut out circles with a ramekin. Cover a baking tray with a piece of parchment paper, and place the dough circles on top. Fill with meat mixture, fold in half and press with the edge of a fork. Brush with egg yolk to glaze. Cook at 350°F for 15 to 20 minutes, or until golden.